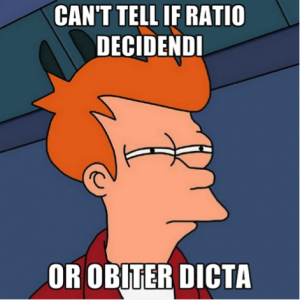 One key piece of knowledge all law students are expected to grasp early on in their legal career is the difference between what a judge says – dicta or obiter dicta and what a case means – the ratio or ratio decidendi. Even when they know the difference, students and practising barristers often prefer to reach for a quotation from a case. It can be comforting to use a well-rounded phrase from Smith J or Jones LJ and it may at first glance suggest wisdom when it really is just about memory. However, reliance on dicta is a really bad habit, does not make better lawyers and can seriously undermine what the law means.